The Hawx series from Atomic is highly regarded for its first fit, warmth, comfort and the ability to personalize shell, cuff and liner. The women's Hawx Prime 95 W has a women's specific tailored cuff height and liner construction to suit women's feet with a medium last. 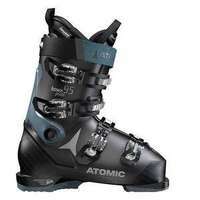 The medium flex makes this boot perfect for advanced skiers looking to shred the whole mountain. Pre-shaped ankles offer a better first fit and you can get a custom boot within minutes using Atomic's Memory Fit for a personalized shell, cuff and liner. The sole of the boot will improve your balance, underfoot feel and control with Atomic's Revolutionary Sole Flex while the 3M Thinsulate Insulation will keep your foot warm in all conditions.